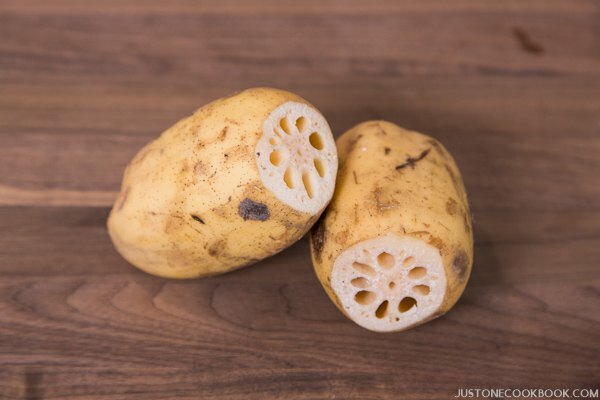 Konnyaku (こんにゃく) is made from Konjac, a plant of the genus Amorphophallus (taro/yam family). 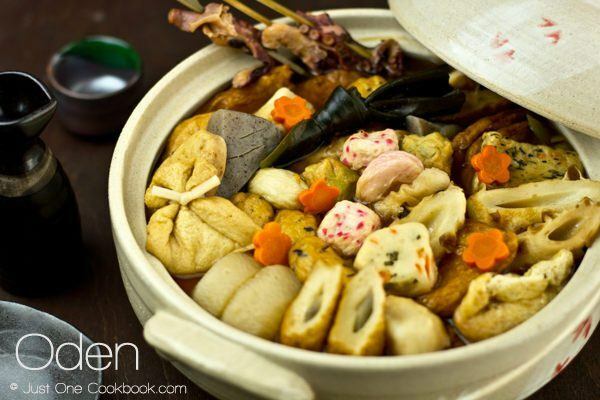 It is cooked and consumed primarily in Japan. The plant is native to warm subtropical to tropical eastern Asia, from Japan and China south to Indonesia. 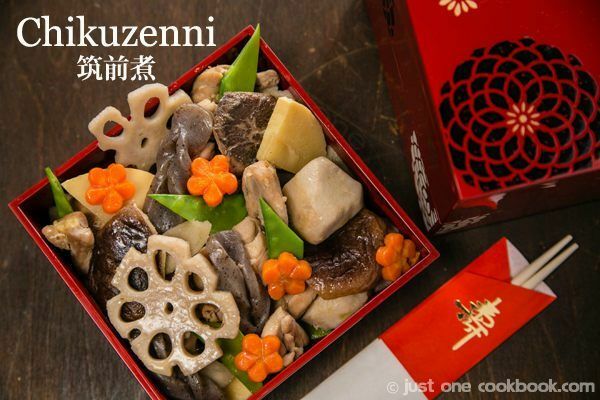 Konnyaku has been known in Japan since the sixth century as a medicinal food and it has been eaten for 1500 years. It is a rubbery, Jell-O like, flavorless food. It is a great diet food as it has almost zero calorie food with no sugar, no fat, and no protein. It is mostly made of water (97%), konnyaku powder and seaweed powder. 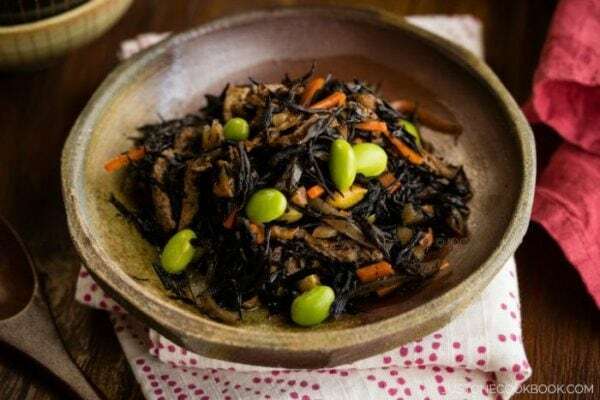 It is a great meat alternative for vegetarian meals. It cleans out your small intestine. I could only find a good video in Japanese. If you find a video in English, let me know! The two basic types of konnyaku are white and grey and Konnyaku comes in different forms. Ita-Konnyaku (板こんにゃく) is a thick grey slab. 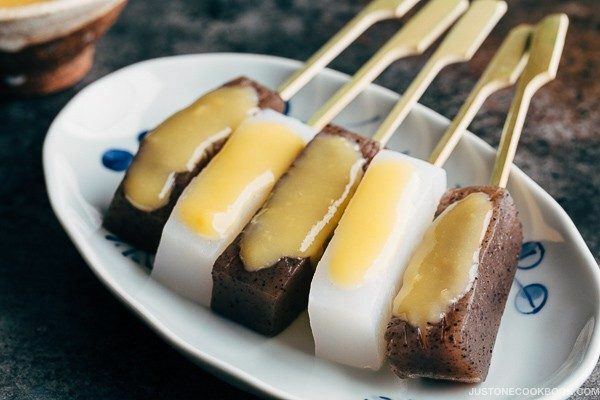 Ito-Konnnyaku (糸こんにゃく) or Shirataki (白滝 or しらたき) is a gelatinous konnnyaku mixture that has been shaped into noodles and they come in both grey and white color. Ito Konnyaku is used in Kansai (Osaka) area while Shirataki is used in Kanto (Tokyo) area. Tama Konnyaku (玉こんにゃく) a grey or white ball shape konnyaku. 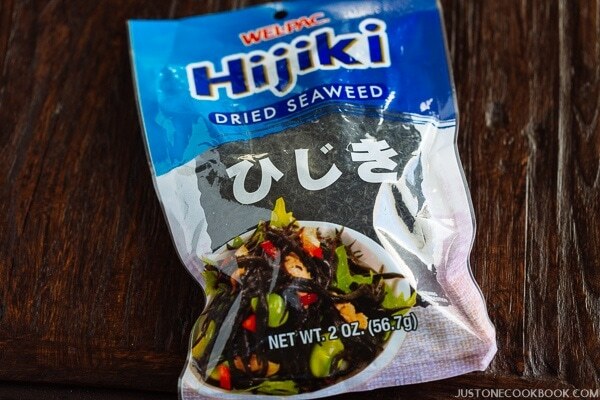 It’s processed in the same way; however, grey konnyaku includes seaweed powder which is why it’s dark in color. 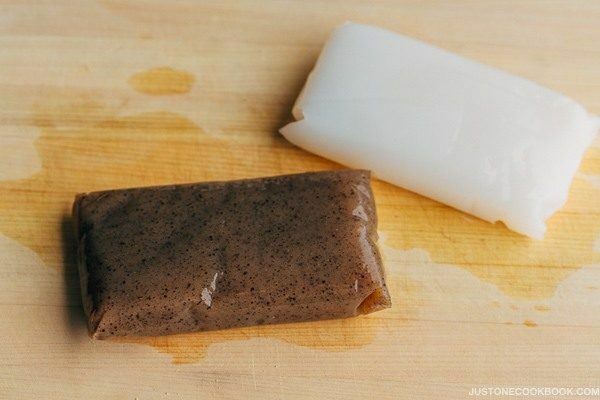 In old days, konnyaku was made with raw yam, so it has a natural brown/grey color due to yam’s skin. 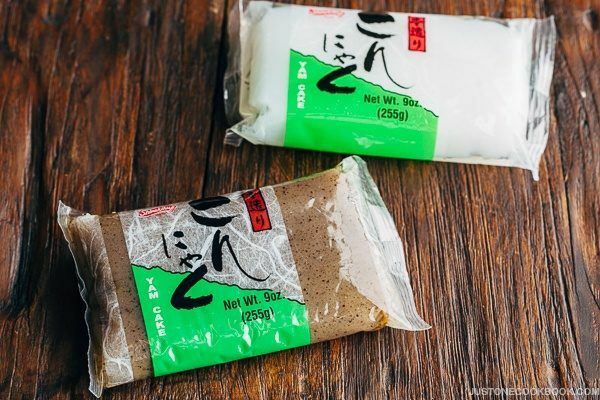 When konnyaku is made with yam powder, it will end up with white konnyaku, seaweed powder is added to bring dark color, just like old fashion konnyaku. Grey konnyaku is used in most of Japan except for northern Japan where while white konnyaku is mostly used. Before you use konnyaku in your recipe, you will need to boil konnyaku. It removes the smell and makes konnyaku absorb more flavors and improves the texture. 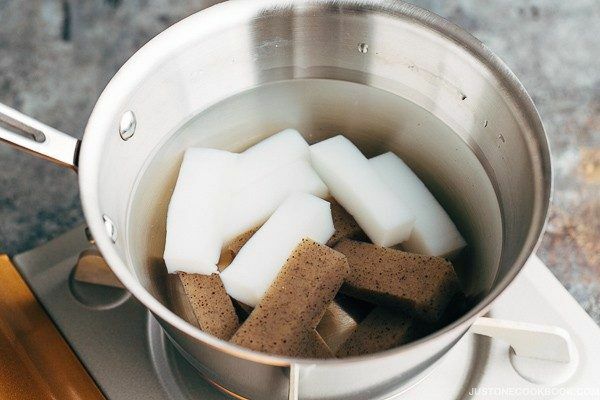 Speaking of the texture, you can decide how you boil it based on the texture you want to achieve. 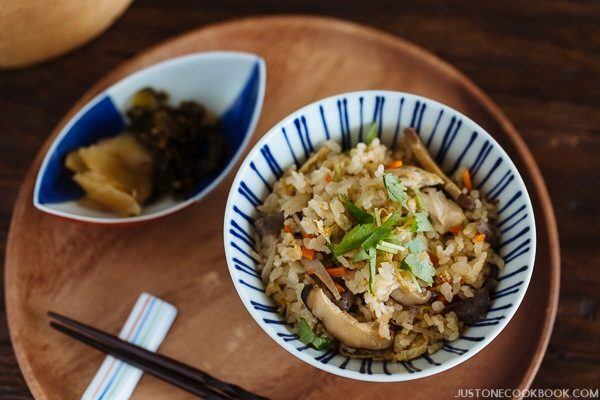 Cook from cold water: Konnyaku lose more moisture with this method. Hence, the texture will be firmer and chewier. Once boiling, cook for 2-3 minutes and drain. Cook in boiling water: Cook in boiling water for 2-3 minutes. The unique smell will go away and the texture will be more giggly and tender. * Don’t cook for too long as it will start losing calcium. * You can also rub konnyaku with salt before boiling to remove the smell. You can submerge the leftover konnyaku in the reserved liquid from the konnyaku package and keep in the refrigerator for up to a month. If you threw away the liquid already, soak the konnyaku in water and keep in the fridge for 1-2 weeks, changing the water every 2-3 days.